But Arkhip Kuindzhi—one of the greatest Russian landscape painters of the second half of the 19th century—didn’t need a criminal scandal to bring his works to the public’s attention. The exhibition’s first four days alone saw over 11,000 visitors, and shortly after, online tickets sold out entirely. According to the Tretyakov’s website, Kuindzhi fans must now be prepared to wait between 3-5 hours in a line stretching down Lavrushinsky Pereulok and around the block to obtain the limited number of tickets available at the box office. Arkhip Kuindzhi was born in the Ukrainian seaside town of Mariupol in 1842, into a poor family of cobblers and goldsmiths. He began drawing from a young age, but because of his family’s financial situation, Kuindzhi received little formal education and was forced to work odd jobs to help make ends meet. According to legend, one of his employers—a bread merchant—noticed the quality of Kuindzhi’s drawings and encouraged him to travel to Crimea to study under the Russian Romantic marine painter Ivan Aivazovsky. 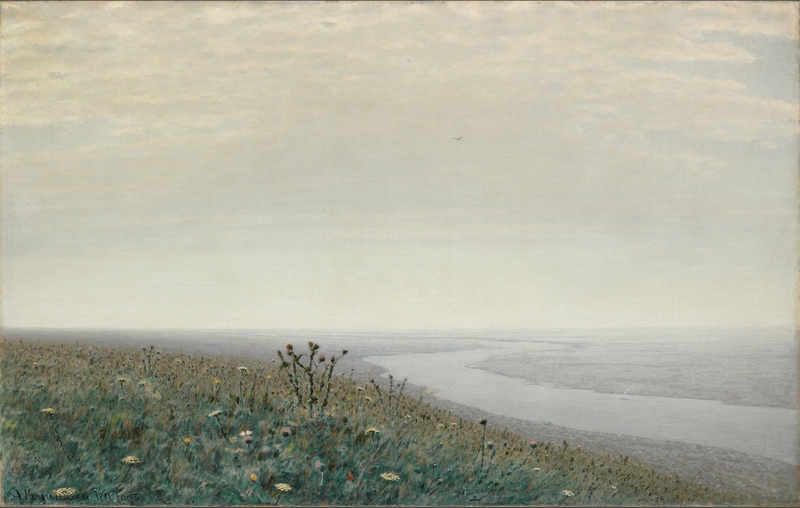 In 1855, Kuindzhi walked the 427 kilometers from Mariupol to Aivazovsky’s studio in Feodosia, Ukraine. Though Aivazovsky declined to work with the “talentless” young artist, Kuindzhi was able to study the principles of painting under one of Aivazovsky’s students, A.I. Fessler, and in 1868 moved to Saint Petersburg to attend the Academy of Arts. Instead of painting scenes from ancient Norse mythology, the students wanted to capture the landscape of contemporary Russia, with its peasants, poverty, and natural beauty. In 1870 they formed the “Society of Itinerant Artists,” which arranged over 48 mobile exhibitions between 1871 and 1923. 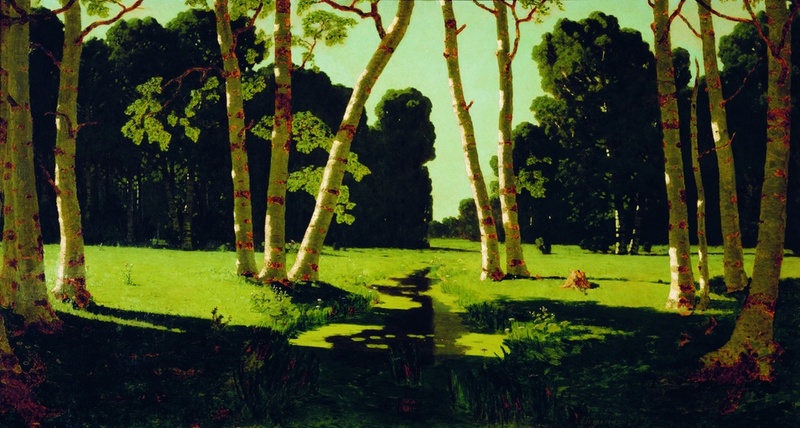 From 1870—1880, Kuindzhi actively participated in the Wanderers’ exhibitions, and at the seventh travelling exhibition gained the public’s attention with his painting “Birch Grove,” in which Kuindzhi meticulously displayed the effects of sunlight washing over a forest. The second floor begins with the section “Mystery of the Night.” Kuindzhi was a reclusive and spiritual man who believed that time spent alone in nature—especially at night—helped reveal the mysteries of the universe. “Mystery of the Night” features paintings of blazing orange sunsets against a blackening night sky, red sunsets over stark cliff faces, and nightscapes of Ukrainian rivers bathed in a greenish, otherworldly moonlight. 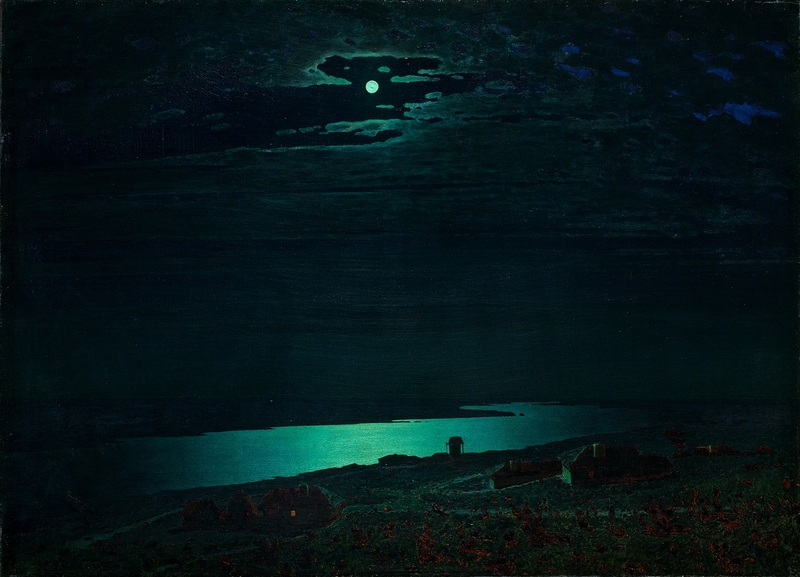 The famous painting “Moonlit Night Over the Dnieper” (1880) marks Kuindzhi’s break with the the Wanderers —he stopped participating in travelling exhibitions but continued to enjoy widespread success despite largely living in seclusion for the last thirty years of his life. The section “In the Space of Eternity” shows paintings from this period of reclusion, most of which didn’t leave Kuindzhi’s studio during his lifetime. The paintings from this later period still highlight Kuindzhi’s lifelong fascination with light, with settings ranging from snowy mountain peaks to seasides half-hidden behind fog, as in the famous painting “Fog on the Sea” (1905-1908). The last section, “Ahead of Time,” is dedicated to Kuindzhi’s more experimental works, many of which tend towards impressionism and indicate Kuindzhi’s interest in new developments in painting technology. The artist constantly experimented with creating new paints, and visitors can learn more about Kuindzhi’s pigments in a special multimedia exhibition located on the gallery’s second floor. Undoubtedly, the long wait to get into the exhibition is partially due to visitors’ reluctance to leave Kuindzhi’s world of color and light. There’s still time to be entranced by the masterpieces of Arkhip Kuindzhi. The exhibition runs until February 17. Tretyakov Gallery Engineering Building. 12 Lavrushinsky Pereulok. Metro Novokunetskaya, Tretyakovskaya.